Record heat in New York Tuesday didn’t prove any obstacle for US players, with six boys and four girls advancing to the third round. All seven of the seeded Americans won, with Francesca Di Lorenzo and wild cards Kylie McKenzie and Alex Rybakov beating seeded opponents on a day when the temperature topped out at a sizzling 97 degrees. The day started with a shocker when top seed Marketa Vondrousova of the Czech Republic retired trailing Viktoria Kuzmova of Slovakia 4-1. The ITF’s top-ranked junior girl, Vondrousova lost in the first round at the Australian Open and at Wimbledon, so the 16-year-old’s junior slam results in 2015, which does include a semifinal at the French this year, have been underwhelming. In the marquee match of the day, No. 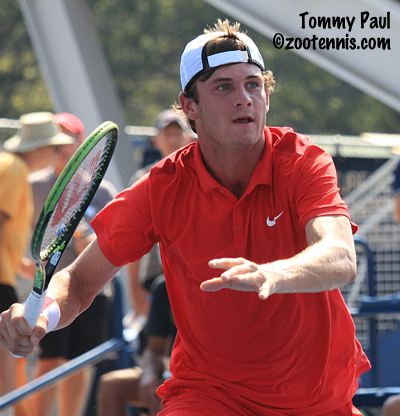 5 seed Tommy Paul, who qualified for the US Open men’s main draw as a wild card and already has a junior slam title at this year’s French Open, was tested and tested again before prevailing over 15-year-old Felix Auger Aliassime of Canada 4-6, 6-4, 7-5. The two hour and 15 minute match, played in the searing mid-afternoon heat, was not on a streamed court, limiting its viewership to those on site, but it proved interesting to dozens of industry insiders, who were there to take a look at the young Canadian, the youngest player ever to earn a Top 750 ATP ranking. Auger Aliassime did not disappoint, breaking Paul at 4-3 and holding on for the first set. Paul went up 4-1 in the second set, but an error-filled service game at 4-2 got Auger Aliassime back on serve. After Paul held for 5-4, Auger Aliassime committed a key double fault and at 15-40, Paul ripped a forehand return winner to take the set. With the heat rule in effect, both players left the court for a 10-minute break. When they returned to the court, it was Auger Aliassime who drew first blood in the third set, breaking Paul at love at 2-2, but Auger Aliassime immediately gave the break back. Although there were plenty of errors by both, the quality of the shot-making was at times spectacular, with both players seeming to hold an edge, or take control, only to see the advantage disappear a point or two later. At 3-4, Auger Aliassime saved two break points with huge forehands that forced errors from Paul, but the third break point went to Paul and he could serve out the match. An ace gave Paul two match points at 40-15, but his first serve deserted him and he double faulted the first match point away. A forehand just long on the second match point made it deuce, and another forcing forehand gave Auger Aliassime a third break point. After an overrule by the chair of a Paul shot that was called out by the line judge caused the point to be replayed, and Paul, who didn’t make a first serve in the last five points of the game, hit a backhand long make it 5-4. Auger Aliassime held quickly to make it 5-5 and Paul followed, putting the pressure back on the 15-year-old. It appeared Auger Aliassime was cramping in the final game, but later he said he had felt a twinge in his knee that inhibited his movement. He went up 40-15, but Paul hit a fine backhand volley winner after closing the net and a backhand and a forehand error by Auger Aliassime gave Paul match point No. 3. He converted it, when Auger Aliassime’s forehand went long, and Paul knew he had survived a tough test, in terms of both the conditions and the caliber of his opponent. Paul also said he thought the heat might have been to his advantage. Auger Aliassime reached the finals of Grade 1 tournaments the previous two weeks, so was not as fresh as Paul, who lost in the main draw of the US Open a week earlier. Accustomed to being the youngster challenging the established professionals, Paul was suddenly the veteran, more than three years older than his opponent. Auger Aliassime’s reputation had proceeded him however, and Paul was aware that Auger Aliassime would be a tough out. Auger Aliassime thought Paul’s experience might have been enough to swing the match in his favor. In the most notable upset in the girls’ draw, McKenzie showed off her big game against No. 3 seed and Wimbledon finalist Anna Blinkova of Russia, rolling to a 6-1, 6-4 victory. But up 6-1, 3-1, the 16-year-old from Arizona began to feel the effects of the late summer heat wave that returned to New York Tuesday. McKenzie also credited Blinkova with raising her level, but at 4-all in the second, McKenzie broke and held easily, showing no signs of nerves as she closed it out. 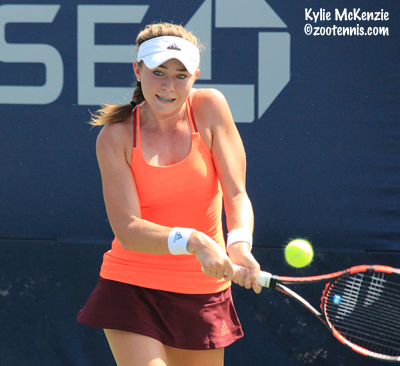 McKenzie will face qualifier Valentini Grammatikopoulou of Greece in the round of 16. No. 8 seed Usue Arconada and No. 9 seed Sonya Kenin, both of whom reached the third round of the Wimbledon Junior Championships this summer, won in straight sets. Kenin, the Girls 18s National champion, defeated Anastasia Pospelova of Russia 6-4, 7-6(3). Kenin served for the match at 5-4, but Pospelova came up with a spectacular running forehand winner on match point, forcing Kenin into a tiebreaker. But the 16-year-old Floridian took control, holding her two serves after five straight points went to the returner, and was able to finish the match in two sets. Arconada was cruising in her match with Chihiro Muramatsu of Japan, but things got a bit sticky before the 16-year-old from Maryland posted a 6-2, 7-5 victory. Di Lorenzo reached her first junior slam round of 16, beating No. 14 seed Wushuang Zheng of China 6-2, 6-3. She will play No. 4 seed and Australian Open girls champion Tereza Mihalikova of Slovakia in Wednesday's third round. Rybakov had lost three times to No. 7 seed and former World No. 1 junior Orlando Luz of Brazil, but on a hot day, on hard courts, Rybakov was the dominant player, taking a 6-3, 6-0 victory. The 18-year-old TCU recruit was down 0-40 at 3-3 in the first set, but won five straight points to hold, and then the next eight games after that. Rybakov’s losses to Luz came on clay, two in South American junior events last year and one early this year in Futures qualifying. 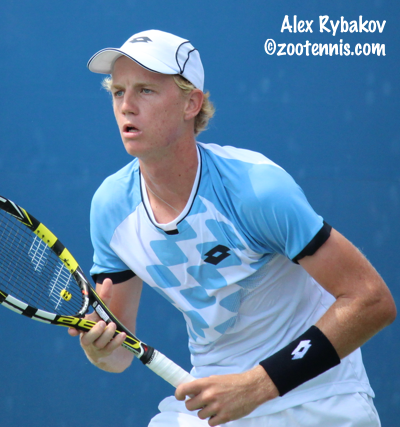 Rybakov will play another left-hander with a one-handed backhand, qualifier Denis Shapovalov of Canada, in the round of 16. Top seed Taylor Fritz had a chance to play one of the last singles matches on the Grandstand, which will not be used in 2016, with a new Grandstand court under construction now. He defeated Yusuke Takahashi of Japan 6-3, 6-4 and will play No. 16 seed Stefanos Tsitsipas of Greece in the round of 16. No. 2 seed Michael Mmoh found his game and his serve at 15-40 2-3 in the first set, hitting three aces and a service winner to hold, then rolled past German Louis Wessels 6-3, 6-1. He will play No. 14 seed Akira Santillan of Japan in the third round. No. 9 seed William Blumberg came back to post a 3-6, 6-4, 6-1 win over a cramping JJ Wolf and will play qualifier Alex De Minaur of Australia. No. 6 seed Reilly Opelka defeated Yosuke Watanuki of Japan 6-4, 6-1, with the highlight of that match Opelka’s serve of 141 mph, which ties him for the second fastest in the tournament, behind Milos Raonic and even with John Isner. Opelka, now officially measured at 6-foot-11, says he doesn’t usually look at the radar gun, but did this time, assisted by the fact it ended a game. Opelka’s opponent in the round of 16 is No. 11 seed Yunseong Chung of Korea. In doubles, top seeds Charlotte Robillard-Millette of Canada and Katie Swan of Great Britain gave a walkover to wild cards Kelly Chen and Carson Branstine. Robillard-Millette , the No. 7 seed, retired in her singles match with an injury earlier in the day. No. 2 seeds and Wimbledon champions Dalma Galfi and Fanny Stollar of Hungary were beaten by Kenin and Kayla Day 6-2, 6-3. Top seeds Mmoh and Fritz escaped in their first round match, beating Luz and Jake Delaney of Australia 6-7(3), 7-6(3), 10-6, after trailing 5-2 in the second set. No. 2 seeds Paul and Blumberg, playing under the lights after Paul’s lengthy singles win, lost to Felipe Cunha Silva of Portugal and Alejandro Tabilo of Canada 6-7(5), 6-1, 10-6. Due to rain in the forecast for Thursday, all 16 third round singles matches and all 16 second round doubles matches will be played on Wednesday. Complete draws are here. Wednesday's schedule is here. Colette, please explain how a player will play the Oracle/ITA Masters Sept 18-20 in Malibu, California…, and play the Toronto Futures during the same time… Sept 14-20? I watched JJ Wolf play a great second round match and it was good to see him display the heart of a champion who refused to retire injured and made his opponent earn the victory. Had a shot at the victory after he broke Blumberg in second but never gave up. Great kid with a great family.